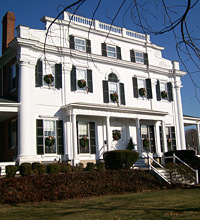 The Dedham Community Association, better known as the Dedham Community House (DCH), was founded in 1922 when Charles J. Kimball and a group of civic-minded citizens purchased an estate originally built by Judge Samuel Haven at the corner of Ames and High Streets in Dedham. The purpose in forming this charitable, nonprofit association was twofold: to preserve the historic mansion built in the Bulfinch design in 1795, and to provide a recreational center for the people of Dedham and the vicinity. 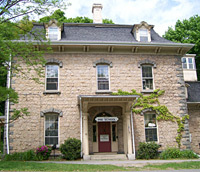 Today, the Board of Directors and staff of the Dedham Community House are dedicated to promoting educational, recreational and civic interests to enhance the lives of all residents of Dedham and neighboring towns through innovative programs, community leadership and the preservation of its historic campus. In fulfillment of this mission, DCH operates a highly regarded preschool, a popular summer camp, summer pool, a variety of enriching classes for all ages, and several special seasonal events. DCH is also proud to actively support other local community groups in a variety of ways including donated or discounted meeting and event space, and by hosting networking events for local nonprofit organizations. DCH’s quality programming serves people of all ages, from all income levels, and from all neighborhoods of Dedham and over 20 surrounding towns. Affordable rates, scholarships and financial aid help to make programs accessible to all. DCH provides more than $100,000 in charitable discounts for programs and donated space each year. Built in 1856, the Bullard House has the distinction of being one of the two surviving residences in Dedham that were built of Dedham granite. The interior of the house retains many of its original finishes, including a fine encaustic tile floor, marble fireplaces, ornamental plaster and wood trim. It is sited on a bluff above a bend in the Charles River, affording it a spectacular setting. Today it houses the DCH Preschool in a lovely juxtaposition of old and new.